Illegal efforts to shape electoral outcomes are not uncommon. from past to present this is continued in any form. Electoral fraud not only undermines public trust in democratic institutions, but also adversely affects the provision of public goods. In India, with more than 800 million registered voters, and a complex multi-party system, electoral fraud has been a leading cause for concern. In several constituencies under the paper ballot system, polling booths would be captured and ballot boxes would be stuffed. 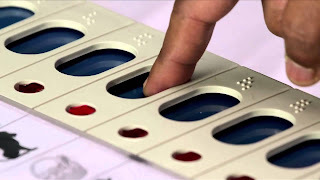 To address fraud and simplify the electoral procedure, the Election Commission of India (ECI) introduced electronic voting machines (EVMs) in the late 1990s. If any kind of fraud can be possible in EVM then it may create a new North Korea. EVMs were introduced on an experimental basis in 1998 in a few constituencies in state assembly elections. Post-2001, EVMs replaced paper ballots for all state elections. An important feature of EVMs was that these could register only five votes per minute. Thus, thes polling booths had to be captured for a longer period to rig elections, thereby increasing the cost of electoral fraud. EVMs would improve the efficiency of tallying electoral results, thereby reducing human error. What is the data supporting the fact? Using state assembly election results between 1976 to 2007, it is found that the introduction of EVMs led to a significant decline in electoral fraud. The introduction of EVMs led to a 3.5% decline in voter turnout. The decline was substantially larger in states prone to electoral fraud, where politicians faced serious criminal charges. These results could also be explained by voters’ negative preference toward voting machines, or the formation of long lines in polling booths due to the upper limit on the maximum votes per minute. To address all of these issues, post-poll survey data was collected and analysed by an independent agency. Interestingly, they found that the ability of vulnerable citizens (illiterates, females, SC, ST) to cast their vote improved significantly after the introduction of EVMs. Additionally, EVMs also led to a virtual elimination of rejected or error-ridden votes. In a rigged electoral system, politicians fail to provide security to ordinary people because they depend on criminal elements in the electoral process. A district-level data on crimes from the NCRB suggested a very strong link between the introduction of EVMs and decline in crime. Also, the introduction of EVMs led to a serious decline in the vote share of incumbent parties. These effects were more pronounced in states prone to electoral violence.